Like any high velocity sport, riding a motorcycle has the potential to cause life threatening injuries including shock, head, neck and spinal damage, profuse blood loss, traumatic wounds, burns, fractures and unconsciousness. Immediate first aid is critical and has the potential to make a big the difference to the outcomes for a casualty. the quick arrival of medical attention. A skilled and confident first aider can achieve this with the right training at a First Aid for Motorcyclists course. 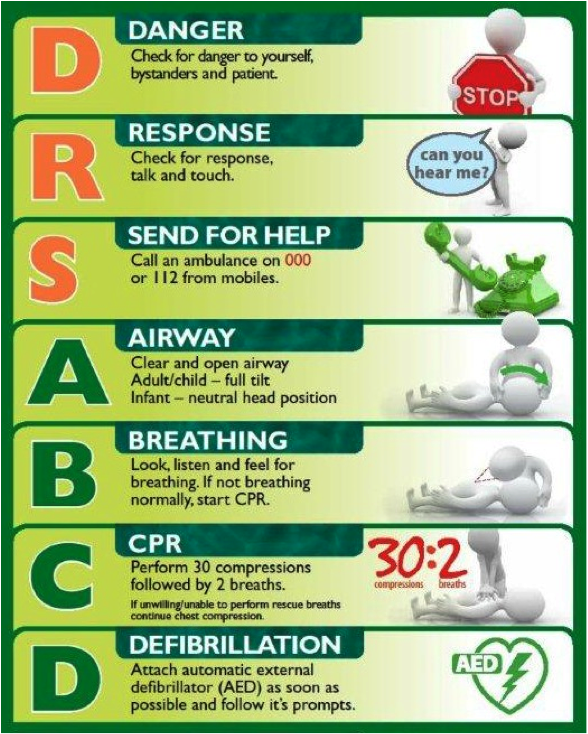 Follow the standard D.R.S.A.B.C action plan to effectively manage casualties and the accident scene. attending to the casualty’s injuries. Check it’s safe to approach the injured person – traffic, powerlines, fire. Don’t forget infection risk, wear gloves. Look, listen & feel for normal breathing. Airway and Breathing* – If the casualty’s airway remains obstructed or breathing is laboured, inconsistent, or constricted, then treat as NOT BREATHING. Helmet Removal** – If the rider is not breathing* a helmet (typically full-face) that prevents access to an airway must be removed immediately for CPR to commence. It is “life over limb” so act fast! Get professional training to perform this vital task. If you don’t know how to remove a helmet correctly then get training. If you are not confident removing helmet, just do chest compressions continuously – hard and fast. A full-faced helmet should only be removed if the injured rider is not breathing* effectively and the helmet prevents access to the airway. In all other circumstances the helmet should remain in place with chin strap undone as it provides excellent support for the delicate cervical vertebrae, so ask the rider to leave it in place until medical aid arrives. Monitor the casualty’s breathing closely and be ready to remove if airway or breathing are compromised. If you want training on how to remove a helmet from an unconscious casualty who is not breathing normally then enrol in a First Aid for Motorcyclists course today! Bleeding wounds can be hidden from view by clothing. Often the puncture made in the Kevlar or leathers is not a true indication of the severity of a wound. Profuse and life threatening blood loss requires that the wound be exposed to the first aider so that direct pressure can be applied with bandages or clothing. Remember to wear gloves and protect yourself and the casualty from infection. For a large gash or open wound hold the wound together and apply pressure with dressings or clothing to minimise blood loss. If possible, elevate the bleeding part above the level of the chest and keep the injured person as still as possible. Avoid giving food or fluids as they may need to go directly into the operating theatre on arrival to hospital. To minimise the physical impact of circulatory shock, keep the casualty calm and still. It’s vital that you provide reassurance and remain calm yourself. Where possible lay them down and cover them with a blanket as their body temperature will drop. Shock occurs when the oxygen supply to vital organs is inadequate. Circulatory shock is a life-threatening medical emergency and once it begins it tends to make itself worse, so immediate treatment is critical. Keep their mind off their injuries, REASSURE them and REMAIN calm yourself. It is possible that a rider can be trapped underneath his or her bike. Extreme heat from exhausts and engine parts can be conducted and contained in leathers, burning the rider. The road surface can burn too. Apply cool, running water for a minimum of 20 minutes. If this is not available, you may need to improvise; use bottled water for example. Remove clothing if possible from the burnt area. If it is stuck, cut around it; don’t attempt to pull it off. Remove jewellery to prevent restricting circulation due to swelling. Protect the burnt area with a sterile or non-stick dressing or closely woven material. In the case of a suspected fracture, keep the injured person as still as possible by packing clothing and equipment around them to prevent movement. First Aid for Motorcyclists have compact, lightweight, water resistant motorcycle first aid kits available at the course. Enrol and attend a First Aid for Motorcyclists course where you’ll practice and learn these skills through a variety of demos, practice and scenarios. By the end of the half-day session you will understand what decisive steps are needed to confidently manage the rider’s injuries and the motorcycle accident scene. Disclaimer: Neither The Motorcycle Council of NSW nor First Aid for Motorcyclists can be held liable for any actions or inaction by any person or persons as a result of the information provided. Motorcycle Council of NSW Inc-MCCNSW-#lookoutformotorcycles shared a post. Do you dare? 😱 JUMP on the bike with our 24 Heures Motos pole man Kenny Foray - La page Officielle and enjoy the 360 view!